Even when temperatures plummet the Thames does not completely freeze over these days, as it did in the past during the so-called “little ice age”. Demolishing the old London Bridge in 1831 improved the flow of the river and following the construction of its replacement structure, with wider arches, it has never again seized up. For some, this innovation was highly welcomed as inclement weather previously disrupted their travel plans on the Thames. In the 19th century, before the advent of railways, the river carried most goods in and out of the capital, so a frost was damaging for businesses. But for others, a cold spell could only mean one thing – it was time to have some fun. During the winter of 1814 Londoners enjoyed major celebrations on the frozen Thames, with a grand mall lined with stalls (named ‘City Road’) running from Blackfriars Bridge. Even an elephant was led across the river. It was not only arguably the best frost fair that London had ever seen, but it was also the last in a long history of such events stretching back to the 16th century. But sometimes during frost fairs the weather conditions changed and the carnival atmosphere turned sour. In January 1789 tragedy struck when a “sudden breaking up of the ice” led to five people being crushed to death. Melting ice dragged a ship which was anchored to a riverside public house pulling the building down and causing the fatalities. To coincide with the 200th anniversary of the last frost fair in 1814, the Museum of London Docklands currently has a small display featuring some of the souvenirs from this historic occasion. 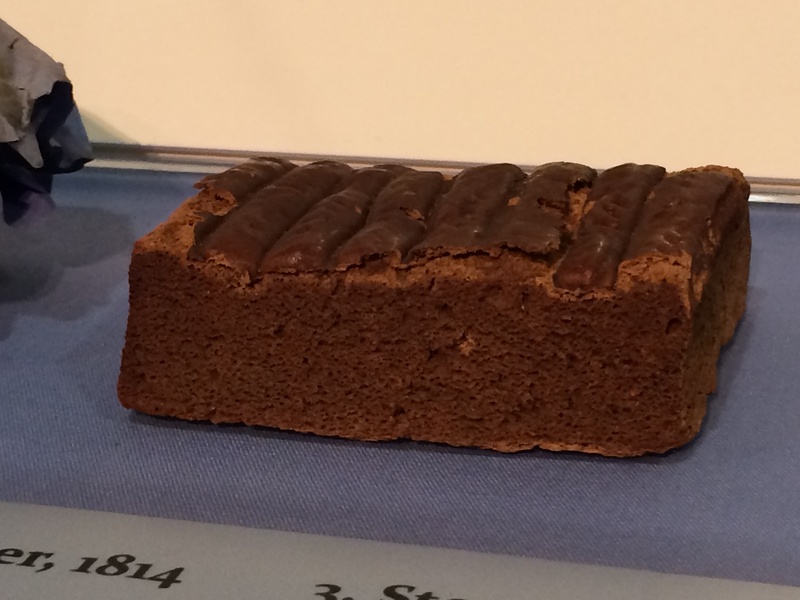 Perhaps the most intriguing is what is claimed to be “the only surviving piece of gingerbread” from the event that year. Retained with its wrapper, it is now apparently “a little hard, but still smells of ginger and spice.” There are also fragments of stone chipped from Blackfriars Bridge that people kept as mementoes. 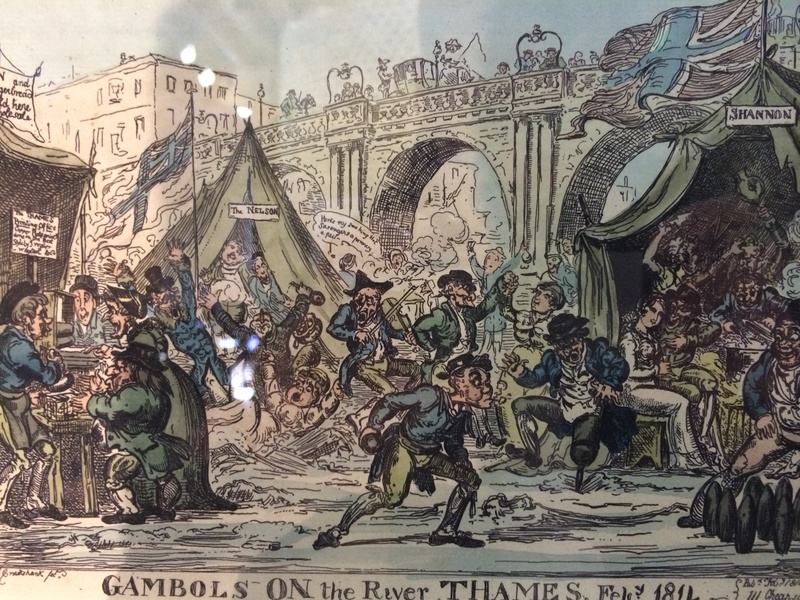 And there are also a wonderful etchings by the satirical artist George Cruickshank that depict the vitality at the 1814 fair. But printing claims the superiority. Sadly the river Thames is unlikely to frost over again. And we can therefore only imagine these wonderful, joyous occasions from the past. Along with the rebuilding of London Bridge, the construction of the embankments also are to blame for why the Thames does not freeze over today, since they made the river narrower and fast-flowing than before. Great blog! Love the Cruickshank picture, had not seen that before. Very interesting, sounds like really good fun, or at least for as long as the ice held up!